Apparently rainy season has come early in San Isidro de Grecia. We were not expecting it until May, but we have now had rain nearly every afternoon for 2 weeks. After only being here 1 year, I should not judge so quickly, but after speaking with many folks whom have been here much longer, we all agree on 1 thing. Rainy season is our favorite time of the year in Costa Rica. After living in Texas with the crazy non-season seasons, Costa Rica must be a farmer's dream. In Texas, sometimes it is hot on Christmas Day and below freezing the next day after a rain storm that night. There is even a saying, "If you don't like the weather in Texas, just wait a minute and it will change." 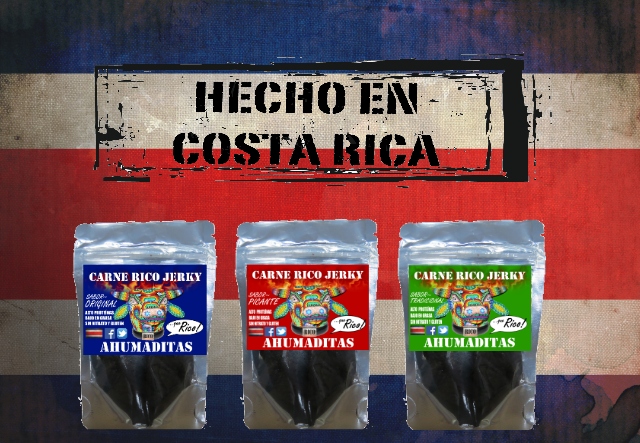 Costa Rica is completely different and extremely consistent. From May to October it rains every afternoon. From November to May it is dry, with little to no rain. So, while you can't ever rely on the rain in the dry season, it always rains in the rainy season, creating a perfect growing environment. I remember back in Texas, I was always looking up into the sky, checking the clouds for a rainstorm; also checking the weather channel for upcoming storms that had a 50/50 chance of actually passing my house. We lived on a lake in Texas and for some reason, there was always rain on the water, but never on my garden, requiring a fair share of water from our well. I always had to turn on the sprinkler. Then, out of nowhere, a rain storm would hit, and I would run out to the garden and turn off the sprinkler. So I am looking forward to not having a "guessing game" while gardening in my new mountainside garden. I have a funny way of sorting and drying my own seeds throughout the year to add to my little box, eventually to grow in my garden or start in small pots to avoid the nagging from my husband. He always thinks I spend too much on flowers, herbs and plants; I do kind of go crazy at the nurseries (vivero) here since the flora and plants are so plentiful and healthy. So anyway, back to my process. Whether I am walking down the street or eating some fruit, I always pick flowers up off the ground or spit seeds into my pocket for safe keeping, until I get home. Once at home, I pull out some coffee filters and write my labels on the the top. I like coffee filters because they do not stick to my seeds and they are the perfect size for wrapping, plus, they are cheap and always on hand at home. If my seeds were from fruits or veges, I wash them first and pat them dry, sometimes leaving them on the window sill for a day or two to dry out. I have to be careful because the ants can take over in the blink of an eye here in Costa Rica. We never found bell peppers in Atenas, so when we moved to Grecia and found red, orange and yellow bells, I bought them and immediately cut them at home to pull the seeds. So after I dry the seeds, wrap them in a coffee filter, labeled, I stick the funny little envelope in a small wooden recipe box. So far, I have enough seeds to add to my garden, plus extra. I still need to buy some lettuce seeds and greens, radishes and cabbages, but my box is full of fruits, vegetables and flowers. One day on our morning walk, I found a perfect peach on the ground that had just fallen from the tree above us on the hill and it tasted great, so I put the seed in my pocket. I have already started the small peach in a starter pot and it growing well, and I remember peach trees to be fast growers. So, garden, here I come. The ground should be just soft enough to start working, so I will get my strong husband to till the ground before I plant some seeds from my box, yes, more complaining to be heard I am sure. While Matt is a strong, hard worker, he does not like digging holes, he is very clear about it. So with a little nagging and begging, I will get him to help me. Here is the before picture and I will document the course of the garden after a few weeks in the rainy season. I am excited to see how it grows. Oh, I almost forgot. I turned my old dog crate into a composter. We had an offer to sell it for $20 US, but after thinking about it, I spent about $140 US on a composter back in Texas and it was only a plastic crate with ventilation, so I turned the dog crate upside down and it makes a perfect composter. Who knew? Pura Vida! 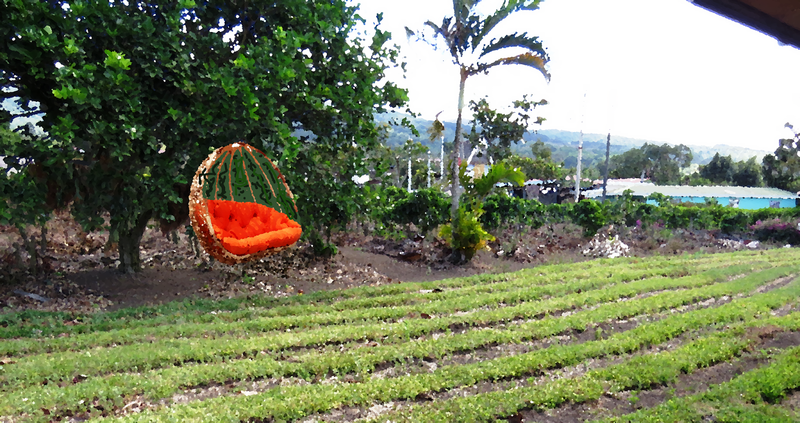 Our new house in San Isidro de Grecia comes with a large area for a garden, with rows already in place and breathtaking views beyond the coffee plants and trees. I have been harvesting and drying my own seeds for 1 year now, so I am happy to get started since I haven't had a garden since living in Texas, where we had 4 large, 5x5 raised squares and I grew okra, peppers, tomatoes, green beans, potatoes, different lettuces, arugula, chards, all my herbs and even some melons and strawberries. I have memories of Max drinking water from the sprinkler. The initial garden was expensive to set up, but it was worth it since it yielded quite a bit of fruits and vegetables. I only had 1 child, Max at the time and so I had plenty of extra time to work the garden, something I am not sure about now, with Max, Sara and Sofi, our newest addition. In a perfect world, I will be pulling weeds, Max and Sara can dig for potatoes and Sofi can swing in her little infant swing hanging from a branch while the songbirds chirp and I occasionally look up and smile. But it will probably be more like this: Max and Sara fighting over the potatoes after trampling through the lettuce and Sofi screaming and crying because she has been left in the swing for more than her threshold of 15 minutes, all while I am trying to pull weeds. Does not sound as peaceful as the first scenario, but maybe I can make it work with the help of my Ipod...sorry songbirds, maybe in about 6 years:) when every last child is in school. I should be excited, nevertheless, about my new garden since it truly sits on the best part of the property, with the best views. Since fresh fruits and vegetables are so cheap in Costa Rica, I have a hard time wrapping my head around growing them myself. I mean, a garden made sense back in Texas since we were paying $1 a tomato and $6 for a watermelon - better to grow it myself. My new garden is way too big for just herbs. So maybe I can grow some nice flowers, calla lilies or roses, they would be great. Bottom line, I just do not have the same urge to grow a garden. The only thing I can think of is growing things that are hard to find, like okra and spaghetti squash, and maybe brussel sprouts or artichokes. I totally lucked out today when I stopped by a small gardening/hardware store just a few kilometers from our new house. They had seed packets galore on a stand by the window, so now I know where to go to add to my current seed collection. And what about the climate here? It is so awesome, I might not know how to handle it? We get springlike weather all day, everyday. I mean what is there not to garden about?? The earth here is rich volcanic soil and with rainy season right around the corner, how can I fail? Am I crazy to think that it isn't worth it to have my own garden because the fruits and vegetables of the locals are so perfect, that there is no possible way for me to get it right? I guess I will just have to challenge myself and give it a go. If anyone read my previous post about how incredible the beets are in Costa Rica, you will understand my quandry. All the fruits and veges here are super-sized, so I guess I will need the extra room in my garden to hold such large, luscious bounty. So I have decided to take a picture of my garden at the same time next year to see if I can grow like the locals. 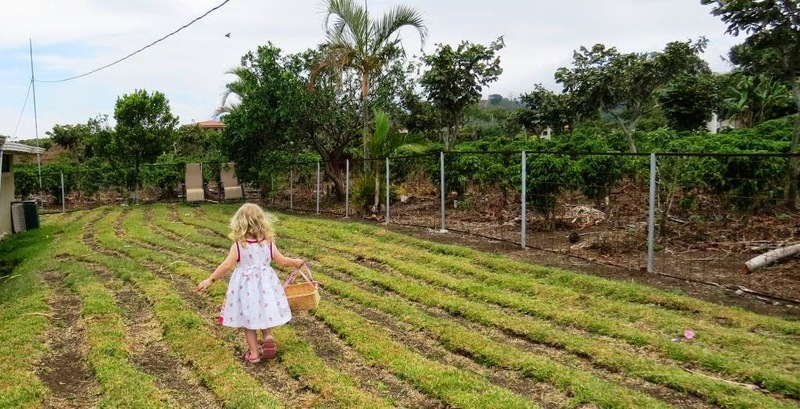 I think I will even add a page on the blog dedicated to gardening in Costa Rica, in case it becomes a habit shared by others, because it doesn't matter whether you grow your garden in Texas, Costa Rica or anywhere, I can testify that food just tastes better and looks better when you grow it yourself. There is a whole new appreciation for that string bean. The kids even tend to appreciate their vegetables better when they had a hand in the dirt with mini shovels and dirty knuckles. I remember Max used to pick all the parsley and eat it raw. Let's see what help he will offer, now that he is almost 5 years old. 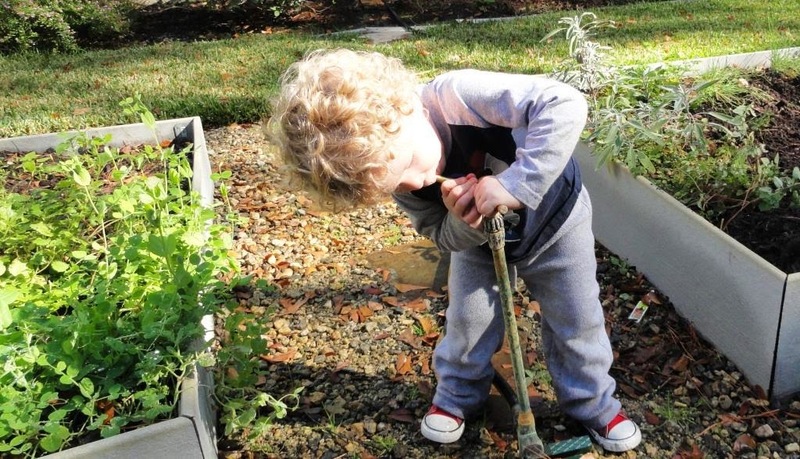 I have a feeling he will still be messing with the water hose, but I think I can train him and Sara and Sofi to appreciate a fruitful garden with a little dirty work. I have already picked out the branch on the tree that I will hang the swing upon. Wish us luck! Pura Vida!